The Pacsafe StyleSafe Tote Bag 14.5L is an anti-theft classic style bag. With room for a 15 inch laptop, clothes and other essentials, it is ideal to carry on a plane, into a meeting, or through the city. 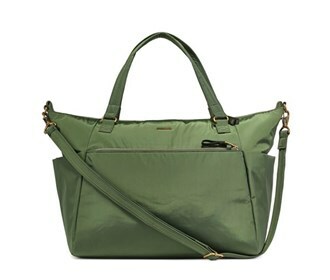 The Pacsafe StyleSafe Tote Bag - Kombu Green has many exciting features for users of all types. See the Pacsafe StyleSafe Tote Bag - Kombu Green gallery images above for more product views. The Pacsafe StyleSafe Tote Bag - Kombu Green is sold as a Brand New Unopened Item.